It seemed like it was all going to happen again. The Harvard men’s hockey team was going to make another late season run, finally playing to its potential and pushing to extend its season further into the ECAC playoffs. It was going to make up for a disappointing regular season, pull itself altogether, and make the Crimson faithful forget about its lackluster performance through most of November, December, and January. Harvard had won Game One, stealing a 2-1 victory from Dartmouth in the first round series of the ECAC playoffs. Despite losing Game Two, the Crimson had jumped out to an early lead in Game Three, poised to salvage its season. But the Big Green had other plans, opening the floodgates with four straight goals, drowning any hopes Harvard had in accomplishing an upset as the last seed in the ECAC. The early playoff exit may not have come as a surprise to many given the team’s regular season record, but it is this very record that was unexpected given the team’s talent and pre-season rankings. So again, as has been asked several times this year, what went wrong? Let’s first take a look at the head coach, Ted Donato ’91, who has been at the helm of Harvard hockey since 2004 after a successful NHL career and a famed Crimson career in which he helped bring a national championship to Cambridge. The Boston native holds a career coaching record of 126-139-35 in nine seasons with Harvard. This includes four winning seasons and five losing campaigns. Despite the overall losing record, something remains to be said about post-season performance, where the Crimson has had fairly consistent success under Donato. This year marks just the second time Harvard has been bounced from the first round during his tenure (the other in 2008-09), and the Crimson has made the ECAC Finals in four of nine years, winning a championship in 2006. Only Cornell has reached the finals more times, with five appearances in an ECAC recently characterized by parity and unpredictability. And in 2005 and 2006, Harvard earned a spot in the NCAA tournament. Moreover, finding talent has never really been a problem for Donato, who recruits top players year after year, as evidenced by the burgeoning NHL careers of Louis LeBlanc, formerly ’13, and Alex Killorn ’12, the trio of Biega brothers, and the rookie class that suited up for the Crimson this year. This year’s roster alone boasted nine NHL draft picks. Has it been a problem with team chemistry and cohesiveness? After a season of following the team and speaking with players, this seems unlikely. Most players are friendly off of the ice, with a significant portion of the team living together throughout the year. Moreover, the squad has periodically shown resilience, evidenced by two wins against BU – one a three-goal third-period comeback, the other in the Beanpot – and a huge upset over No. 1 Quinnipiac, its first victory against a top-ranked team since 2004. But just when it looked like they were about to turn the corner, more setbacks and inconsistencies resurfaced, with the longest unbeaten streak of the season halted at four. Nevertheless, Harvard must find a way to parlay its late-season life and urgency to the rest of the season in order to prevent another year in which it enters February with a losing record. Six seniors graduate this year. Alex Fallstrom and Luke Greiner led the team in points for the Crimson, marking the second straight year Harvard will lose its top scorer. Marshall Everson led the team in goals with 11. Conor Morrison and defenseman Brenan Rempel will also depart. Captain Danny Biega, a three-time all-Ivy selection and a force both on defense and offense, will be especially missed. Next year, the Crimson hopes to see the return of sophomores Patrick McNally and Max Everson, who should aid what was a surprisingly unproductive power play. Furthermore, in addition to another promising recruiting class, Harvard will look to the continued development of its freshmen forwards, including Ivy League Rookie of the Year Jimmy Vesey, Brian Hart, and Kyle Criscuolo, as well as top sophomores Colin Blackwell and Tommy O’Regan, to improve its ECAC-worst 2.04 goals-per-game average. Last season, Harvard was picked to finish last in the ECAC before the season began, but finished third and lost in the ECAC finals when its season ended. This season, Harvard was picked to finish third in the ECAC but finished last and lost in the first round. It is difficult to project where the Crimson will end up despite the strong talent it possesses. 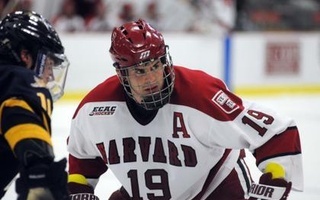 But regardless, the storied history of Harvard hockey, with which Donato is intimately familiar, implores improvement. It may be a long way from another Frozen Four appearance, but it seems that the Crimson can only go up from here. —Staff writer David A. Mazza can be reached at damazza@college.harvard.edu. Follow him on Twitter @David_Mazza1. “This is Harvard Hockey, A Tradition of Excellence.” The tag-line on Harvard men’s hockey’s media guide doesn’t leave much room for error.